What is a birthing ball? What are the benefits of using a birthing ball? What is the difference between a birthing ball and a gym ball? What type of birth ball should you buy? What is the ideal size of a birthing ball? When can you start using a birthing ball? How to use a birthing ball during pregnancy? How to use a birthing ball during labor? How to use a birthing ball after the baby’s birth? Most women prefer a normal delivery to a C-section. If you do too, you can try using a birthing ball to increase your chances of a vaginal delivery. A birthing ball can make the process of birthing more comfortable for you. 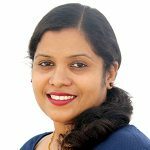 MomJunction tells you all that you need to know about this handy tool and how it can be beneficial for you. A birthing ball or a birth ball is a big inflatable exercise ball made of rubber. It is a standard fitness ball that can be used by pregnant women for fitness during pregnancy and post pregnancy (1). The birthing ball is a safe and beneficial non-pharmacological technique to have a normal delivery. Here are a few potential benefits of using a birthing ball (2). Eases back pain and improves your ability to move around. Note that some people may feel dizzy or ill while using the ball. If you do, refrain from using it. Birthing balls and gym balls are almost similar and made of anti-burst materials, which means they only deflate slowly and not get punctured. However, there are a couple of differences between the two: birthing balls are bigger than gym balls, and they come with an anti-slip finish. Take the one with anti-burst feature and an anti-slip finish; In any case, do not keep these exercise balls near sharp objects, rough surfaces, direct heat generators such as heaters, radiators, blowers, open fires and stoves. The ideal size depends on your height, as mentioned in the table below. Note: When you sit on the ball, the hips need to be higher than the knees. Otherwise, it is an indication that the ball is small for your height or it needs to be filled with more air. The birth ball usually deflates with time and can be inflated using an air pump (4). Sitting with your knees higher than the hips can disturb the fetal position and lead to prolonged and painful labor. 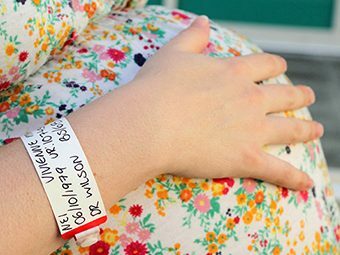 Here are a few tips for first-time users of a birthing ball. Place the ball on a carpet or a rug and not on the floor. Go barefoot, or wear anti-skid shoes. Have someone hold your hand and support you from the back when sitting on the ball for the first time. Place your feet firmly on the floor for gaining balance. Place one hand on the ball and slowly lower yourself to sit on the ball. Now, place your hands on the knees and try rocking the pelvis sideways, and back and forth. Once you feel you are comfortable with it, bounce on it a little. If you are not comfortable with the rocking or bouncing movements, place a chair near you for support. Make sure that there is enough space around you when you exercise on the ball. Breathe normally, control your exercise movements, and stop the activity if you experience any pain. Knowing when to use the birth ball during pregnancy is essential to stay safe and make the most of it. The first trimester is the best time to start using the birthing ball. 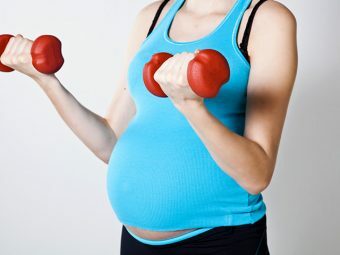 You can also start exercising on it later during the pregnancy, although you may have difficulty getting used to it, considering how much your body would’ve changed with the growing baby. Next, we tell you about how the birthing ball can be used during pregnancy, labor and after birth. It is much easier to get on and off on the ball than it is to sit on a soft sofa or a hard chair. Sitting on the ball is also a mini workout. Rocking and bouncing on it gently can keep your tummy and back muscles upright. Birth ball offers the needed balance, improves posture and exercises your tummy muscles. It gives the required support to bear the pregnancy weight. Rock your pelvis sideways and back and forth while sitting on the ball (pelvic tilts). Pull your tummy inside and try curving your lower back gently. Repeat to strengthen your uterus and lower back. You should not involve your shoulders when doing this, and movement should start from the waist and below. Rotate your hips clockwise and anti-clockwise while sitting on the ball. Remain in a kneeling position, and then lean over the ball (resting child’s pose). Now rock your hips front to back. It helps you relax. You can also try pelvic floor exercises using the birthing ball. It is much easier, and you will be working on the lower tummy muscles. Lean forward on the ball and try to get on your knees. Forward-leaning positions while on the ball will help the baby adopt the upright birthing position. This will make the baby move into the anterior position, with their back towards your tummy. Though the baby is not going to remain in the same position until labor, exercising on the ball can at least offer you some relief from back pain. 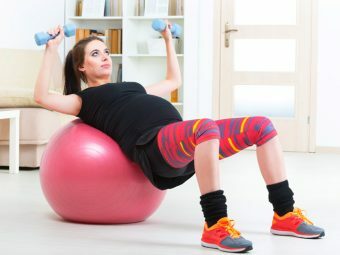 Working out on the ball before you go into labor can make you feel comfortable. Some healthcare providers also recommend using TENS (transcutaneous electrical nerve stimulation, drug-free option for pain relief) along with the birthing ball to cope up with early labor. Sit on the birth ball with your feet shoulder-width apart. Now rock your pelvis side to side and from front to back (like using hula hoops). This helps to stretch your body so that the baby moves into right birthing position. Lean over the ball in a kneeling position. Try swaying in this position to gently stretch your back. Get onto all your fours by hugging the ball, and gently lift your bottom from a kneeling position called the resting frog squat. Rock your pelvis sideways. Lean over the ball while standing, with the ball placed on the bed or an elevated platform. This position gives gravity needed for the baby’s descent. Bouncing gently on the ball strengthens your legs and improves your ability to balance. It is also helpful in giving counter pressure you require during labor. If you are worried about falling off the birthing ball, try sitting upright on the peanut ball, an alternative to the rounded birth ball. Research also shows that the use of the peanut ball has the potential to reduce the labor duration and cesarean rate in those with epidural (5). Lie on your side using a peanut ball. It helps you rest and sleep well. It also keeps your pelvic region open when resting. Besides making normal delivery easy, the birthing ball can also help you stay fit and recover faster after childbirth. Check with your doctor before planning to use a birthing ball. You can get a personal trainer or a specialist dealing with women fitness, if necessary. You will feel sore for some days after the delivery. Sitting on the ball is more comfortable than sitting on a hard surface. Once you get the baby to latch conveniently, you can sit on the ball when breastfeeding. It can be better than slumping on the bed. You can also cuddle and soothe your crying baby while sitting on the ball. Exercising with the ball helps tone up your post-pregnancy body. You can also make your baby stand, walk and scoot on the ball. Exercise and body fitness are the best ways to improve your chances of a natural delivery. And a birthing ball can offer you that and more. Isn’t it nice to use the ball to ease the pregnancy and labor woes? Have you used this already? Share your story in the comment section. Is It Safe To Do Planks During Pregnancy?